I just ran across this important info. I also read that it is an apparent disgruntled employee of a farm worker(?). 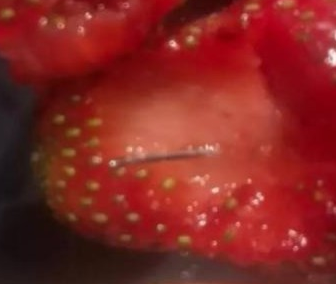 Putting needles (sewing) in strawberries obviously takes a little time…and you’d think that he or she would be seen doing such. But,..that’s an official apparent scenario. In any case…be watchful if you buy strawberries from anywhere! Previous Previous post: Wildfires in the Northern Dead Sea, Israel (VIDEO) ?